The Rosette Nebula is a star-forming region about 5,000 light years from Earth. Observations from the Chandra X-ray Observatory reveal about 160 stars in the cluster known as NGC 2237 (right side of the image). Combining X-ray and optical data, astronomers determined that the central cluster formed first, followed by neighboring ones, including NGC 2237. The RosetteNebula, a hotbed of star formation about 5,000 light-years from Earth, isphotographed in a stunning new image from NASA's Chandra X-ray Observatory. On the rightside of the image is a cluster named NGC 2237. A recent Chandra study, led by JunfengWang of the Harvard-Smithsonian Center for Astrophysics in Cambridge, Mass., probedthe low-mass stars located in this satellite cluster. Previously, only36 young stars were known in NGC 2237, but Chandra data provided a much clearercensus, and increased the tally of known stars to about 160. Optical datafrom the Digitized Sky Survey, an online astronomy database, and the Kitt PeakNational Observatory near Tucson, Ariz., are represented by the purple, orange,green and blue light. These data show large areas of gas and dust, includinggiant pillars that are residual landmarks leftover after intense radiation frommassive stars eroded the more diffuse gas. The presenceof several X-ray emitting stars around the pillars, and thedetection of an outflow of gas ? commonly associated with very young stars ?originating from a dark area of the optical image indicates that star formation is still continuing in the cluster. Corroboratingthese results with earlier studies, the astronomers concluded that the centralcluster in the nebula formed first. 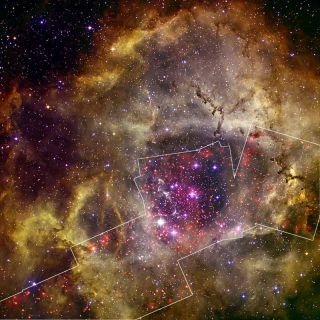 The subsequent expansion of the nebulatriggered the formation of the two neighboring clusters, which includes NGC2237.